Ita��s not the easiest of jobs a�� to get out of bed at six in the morning, only to switch on your geyser. That was one of Deepankar Garga��s constant struggles. The other being going around the house at night to switch off lights. His senior from IIT Guwahati, Deep Singh, had similar troubles. Their a�?lazinessa�?, as Garg admits, led them to launch Inoho this May. What their startup lets you do is connect electrical appliances at home to your smartphone, PC or laptop (any internet-enabled platform). And, control them though wi-fi at home. 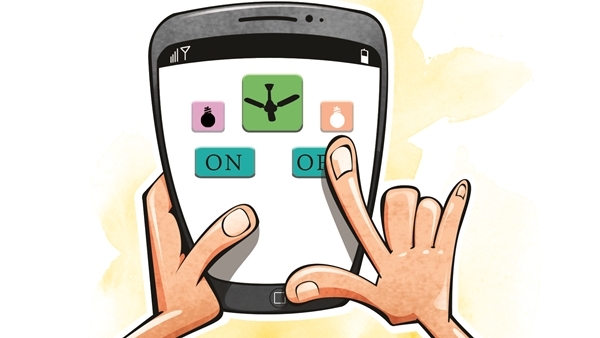 That means, you can turn on/off fans, lights, ACs and geysers through simple clicks and swipes, without making those frequent trips to the switchboards. You can do this not just when you are at home, but even when on the move, or vacationing elsewhere. And, if you are the forgetful kind, simply set schedules to switch on or off each device. The duo has sold a thousand Inoho kits around the country to technology enthusiasts, people in genuine need and real-estate developers who want to sell a�?smart homesa��. But Inoho (innovative homes) is not alone in the home automation market. So, wherea��s the edge? Garg says, a�?The other products need to be integrated at the time of the construction of your house. Or, you need to redo the wiring to fix them. We, instead, provide you a kit, comprising a switchboard module and a home controller. This module fits easily behind your existing switchboard panel and takes 30 minutes to install. You can even do it yourself.a�? Its cost? The starter kit, offering five switches, is worth `12,000. In the coming months, features such as curtain controlling, watching live feeds from inside your house, regulating the speed of fans and ACs and changing TV channels will also be added. a�?In a way, Inoho is helping cut down electricity bills,a�? says Garg, 30, who looks after marketing, while Singh, 32, takes care of the technology. a�?There is a behavioural change. Not a day has gone by when we forgot to switch off our geysers or lights.a�? But this one testimonial has them convinced of their product more than any. Garg narrates, a�?An old man in Chennai has two homes. Every alternate day, he would travel 40 km to his second home to do, you know, what? Water his plants. Now he controls the water sprinklers with our app.a�?